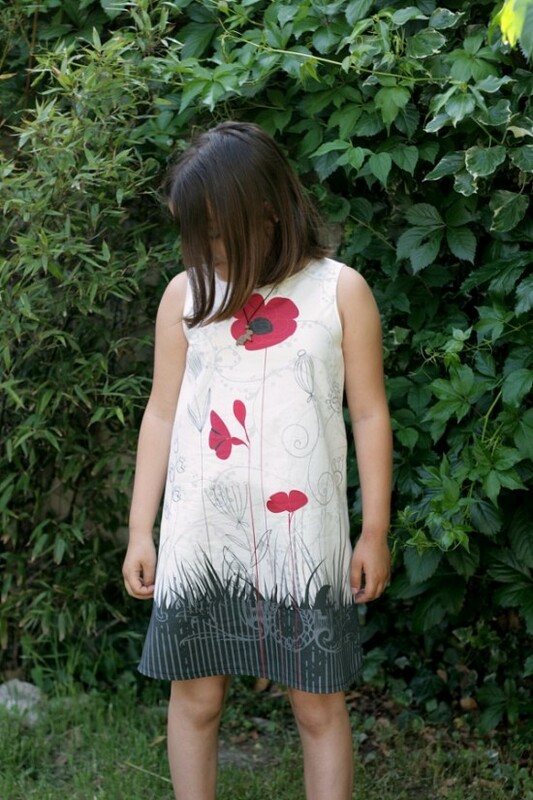 This pretty poppy dress is the first dress sewn with my Petite Chérie (my 8 years old DD… No, that’s not her real name). Petite Chérie was super proud of the result and wore the dress the next day, telling everyone who would listen (or not ^ ^): “I did it … with Mom. I cut here and there and I sewed here and there. ” She was delighted! 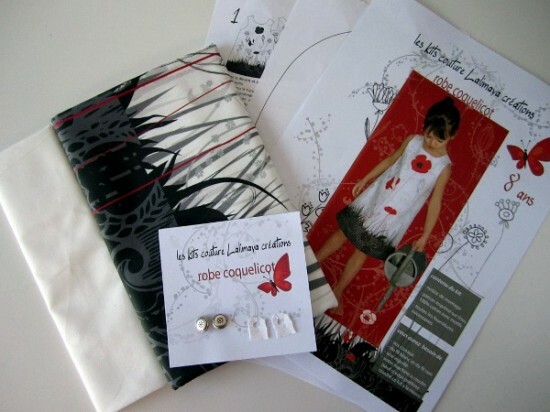 The pattern is in fact a sewing kit from Lalimaya called “Kit robe coquelicot”, here in size “8 ans” (8 years old). 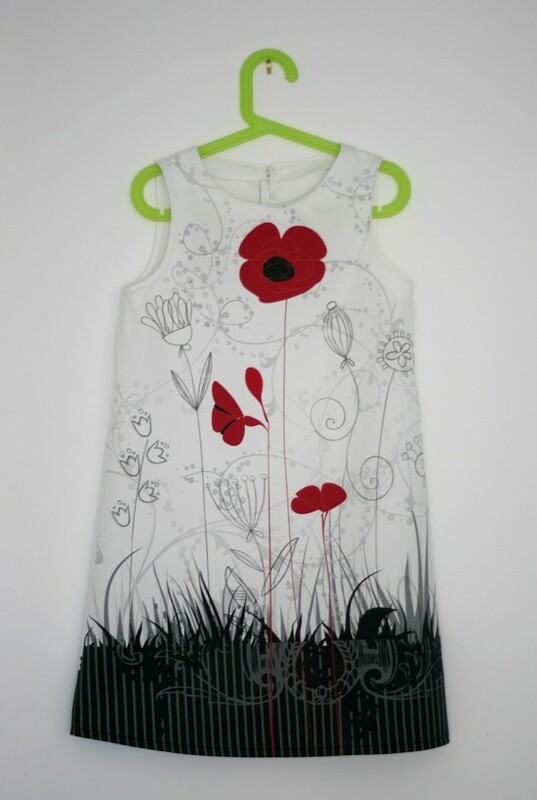 It’s a little A line dress with a unique poppy print. Lalimaya is a small French sewing patterns company which offers patterns, kits and books. This sew kit includes : (from left to right in the picture) the fabric and patterns for the facings, the “Poppy” fabric with the pattern already traced in the size that was ordered, two buttons and fasteners, instructions. 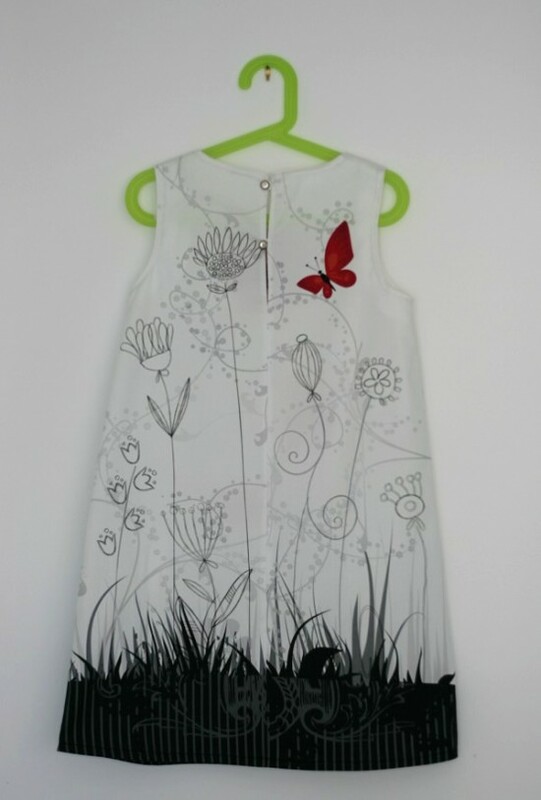 Price: 32 € to 35 € depending on size (2 – 8 years). When I saw the kit, I immediately thought it would be a perfect and easy project to sew with Petite Chérie. And I totally fell in love with the beautiful print, which is a Lalimaya design ! I admit that the price might have stopped me but I took advantage of a 20% discount code at the time. When you think about the supplies and work done to make this kit an easy and fast sewing project : the price is reasonable. Especially since the quality of the printed fabric is beautiful. And a pretty dress like that in store is at least that price (in France anyway). Nothing that has changed the design of the dress. Added 0.5 cm on the sides of the dress on the front and back: from the bottom of the armhole to the bottom of the dress. 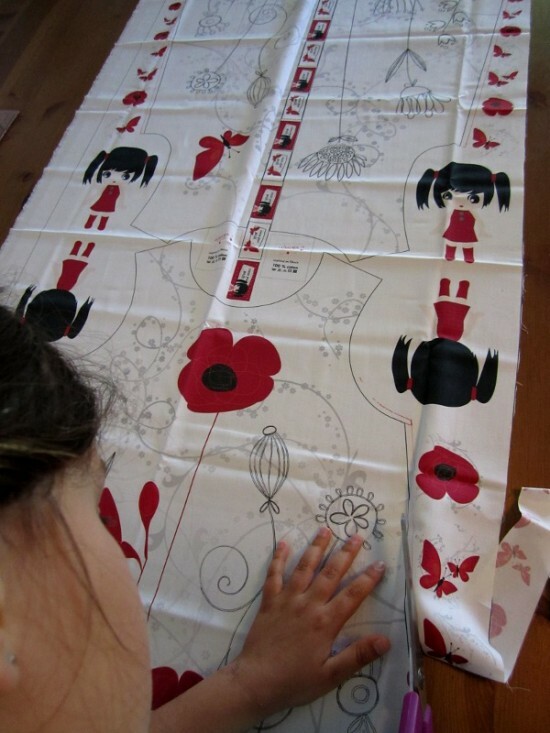 You can see the red lines on the picture of Petite Chérie cutting the dress (see below). Used a smaller sewing allowance. o,6 cm instead of 1 cm. After fitting I also decided to make a hem slightly smaller (1.5 cm) than the one recommended in the instructions (3 cm), Petite Chérie is tall. Nothing difficult. The dress has three pieces: a front and two half-backs. It closes at the upper back by one or two buttons. The sleeves and neckline are finished with facings. If you sew this dress yourself, it is done in a morning. But before starting, I wasn’t at ease… Petite Chérie is 8 years old and at 8 years old it’s a bit difficult to stay focus for too long. So I told myself that if necessary we would make the dress in several short sessions. That’s what we did, we spread it over the day. It must be said that Petite Chérie listens to her mother… Sometimes… And with a pair of scissors in a child hand, horrible things (like cutting inside the dress pattern) can happen quickly. But I told myself that if I wanted her to gain confidence I needed to let her do things, under my supervision. I had to limit the “Ahhhhhhhhhhhh be careful !” “Noooooo not like that”. In short I was a little tense. I let her cut the dress and she just asked for my help to cut the curves because she had trouble with the big scissors. She assembled the dress all by herself and I did all the less funny stuff: serging, facings, sewing buttons, … Well of course there were some unavoidable not-so-straight seams but overall she did a very good job ! And all went well ! She learned some basics for cutting and sewing and she’s very proud to wear a pretty dress SHE made… I think that if all goes according to plan, she’ll embrace the dark side soon ^^. Petite Chérie cutting the dress. Petite Chérie sewing the back and front together. 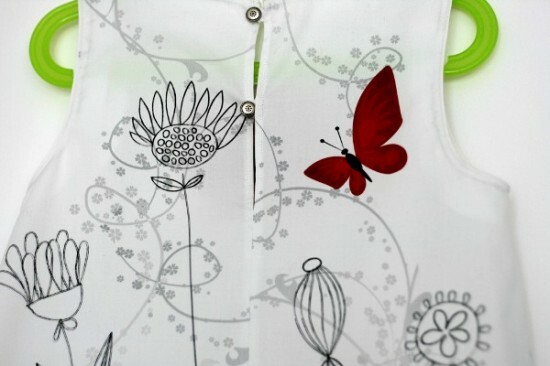 Détail of the butterfly on the back. 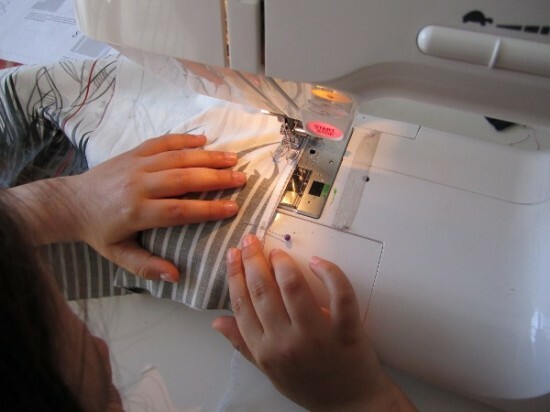 This entry was posted in Blog, Children Clothes, Sewing Projects and tagged Lalimaya by Véro. Bookmark the permalink. The fabric design by Lalimaya really makes this basic A line dress stand out ! And that’s what sold me on the kit.